BARBARA S. PETITT, PHD, CFA, is Director, Curriculum Projects, EMEA, in the Education Division at CFA Institute. She holds a master's in management from EDHEC Business School as well as a master's in research and a PhD in finance from the University of Grenoble. She is a member of CFA Institute and CFA Society of the UK. JERALD E. PINTO, PHD, CFA, has been at CFA Institute since 2002 as Visiting Scholar, Vice President, and now Director, Curriculum Projects, in the Education Division for the CFA and CIPM programs. He holds an MBA from Baruch College and a PhD in finance from the Stern School and is a member of CFA Virginia. 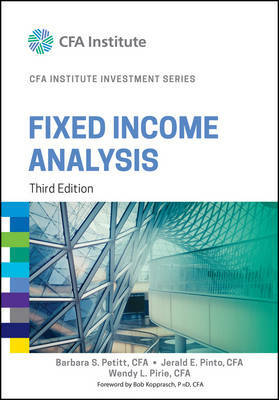 WENDY L. PIRIE, PHD, CFA, is Director, Curriculum Projects, in the Education Division at CFA Institute. She holds a PhD in accounting and finance from Queen's University at Kingston, Ontario, and MBAs from the Universities of Toronto and Calgary. She is a member of CFA Institute, New York Society of Security Analysts, and CFA Society of Chicago.